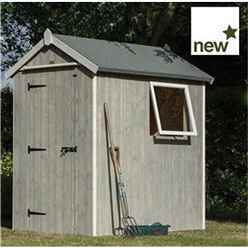 The Deluxe Heritage Shed provides extra headroom which enables large bulky items to be stored. The apex style roof is an attractive feature of any garden. The large lockable door ensure your items are kept safe. The shed is constructed from high quality tongue and groove shiplap cladding which is supplied with a free factory basecoat dipped in a grey wash paint finish. The high quality floor joists give the shed a solid and sturdy feel and allow a larger load capacity making the Deluxe shed ideal for storing larger heavy items.